Ten State Bar members who work in the public interest law arena talk about why they chose to pursue this career and what keeps them going from one day to the next. Etched in Karen Bauer’s childhood memories is a time when her family needed legal help … and couldn’t afford to get it. The Bauers had flooding in their basement and hired a contractor to fix the problem. The contractor began excavating around the house’s foundation and then, upon receiving the balance of the money due, he vanished. The family had a moat and tarps surrounding their house for months while Bauer’s working-class parents scraped together enough money to complete the job. They couldn’t afford to hire a lawyer to seek restitution; it was simply cheaper to pay a different contractor to finish the work. “I remember my strong, intelligent father feeling so helpless and frustrated because he had no recourse. That was scary to me as a child,” recalls Bauer, who today is a lawyer with the Legal Aid Society of Milwaukee, where she focuses on consumer protection cases. Her family’s ordeal was one motivation behind Bauer’s decision to become a public interest lawyer. Not all those in public interest law can look back on such a personal experience. But a commonality among these lawyers is a commitment to serving the legal needs of people who can’t afford to pay the going rate of most law firms. The need for these lawyers’ assistance is huge. In Wisconsin, 13.3 percent of residents live in poverty, according to a recent study by U.W. Madison’s Applied Population Laboratory. A family of four, for instance, living in poverty has an annual income of $24,300 or less, based on the 2016 federal poverty guidelines. Certainly, that income level doesn’t adequately cover basic needs, much less pay for hiring a lawyer. But even families of four with incomes up to 200 percent of the federal poverty guidelines, or $48,600, usually have to forego hiring legal help in order to pay for housing, food, transportation, and other essentials. As of 2015, 29 percent of Wisconsin families fell below the 200-percent-of-poverty line, according to estimates of the Henry Kaiser Family Foundation, a nonprofit, nonpartisan organization focusing on national health issues. Various efforts are under way to improve access to civil justice in Wisconsin (see the article on page 22). One such effort is public interest law practice, defined here as providing legal representation to people and groups who typically are left unrepresented or underrepresented. In this article, you’ll meet a few State Bar of Wisconsin members who work in the public interest law arena. These lawyers talk about why they chose to pursue this career and what keeps them going from one day to the next. When Nicole Penegor looks at the scope of the need among legal services clients, she’s reminded of the starfish parable she first heard years ago from Wisconsin Supreme Court Justice Shirley Abrahamson: When you walk on the beach and see lots of starfishes marooned on the shore, you may feel the urge to save them all. You can’t. But you pick up as many as you can and return them to the sea. Penegor joined Legal Aid in 2000 and today is chair of the State Bar’s Public Interest Law Section. She entered law school knowing she wanted to pursue this type of practice after working on women’s rights issues between college and law school. Jodi Hanna, Disability Rights Wisconsin, Rice Lake. Jodi Hanna’s first public interest law job involved working with migrant farmworkers in Ohio. She remembers that when she would lay out legal options to clients for their cases and ask what they wanted her to do, they’d respond that she should do whatever she wanted. These days Hanna is standing up for the legal rights of people with disabilities. She’s been with Disability Rights Wisconsin for 17 years – 13 of those in Madison and the last four as director of the Rice Lake office, which serves clients in 17 northern counties. Learn more: Jump to the sidebar below. “I like to do a little bit of everything,” Hanna says, “and this is a job where I can do that.” Her work is a blend of representing clients, handling administrative tasks, and building relationships with other community organizations. To navigate the ups and downs of law practice, all lawyers need a measure of resilience. Public interest lawyers need an especially hefty dose, says Bobby Peterson, executive director of ABC for Health in Madison and one of the founders of the State Bar’s Public Interest Law Section in 1998. That philosophical view has guided Peterson through more than two decades in public interest law. He started while at U.W. Law School, doing an internship at the Center for Public Representation (CPR), now called the Economic Justice Institute. As an intern, he interviewed people who couldn’t afford or were denied health insurance and racked up medical debts. “Those stories had a profound impact on me,” Peterson says. After spending a few months traveling after law school to figure out his next move, he returned to visit Louise Trubek at the CPR and learned she’d won a grant based on Peterson’s student research project. She would be hiring a lawyer. “A shiver went down my back,” Peterson recalls, “and I knew this is what I wanted to do. The life force kind of pulls you along sometimes.” Eventually the project spun off from CPR to become ABC for Health, a nonprofit law firm that in 23 years has grown to five lawyers, 17 staff, and two subsidiaries with another soon to launch. Mary Bryn Concannon, Wounded Warrior Project, Houston, Texas. After graduating from U.W. Law School in 2015, Mary Bryn Concannon’s career search led her to a “J.D. preferred” job with the Wounded Warrior Project in Houston. She’s not working as a lawyer per se, but “I rely on my legal skills every day as a VA-accredited veterans benefits liaison,” she says. In law school, she focused on disability and mental health law and took internships in those fields. Now she’s helping post-9/11 war veterans with physical disabilities, post-traumatic stress disorder, and military sexual trauma. She’s part counselor, part legal advocate. Concannon traces her interest in public service back to the age of nine when she and her dad volunteered at a soup kitchen in Kenosha, her hometown. While in high school, she worked with people with disabilities and did so again during a stint living in Australia. “Working in nonprofits, especially with people with disabilities, has always been my passion,” she says. After graduating from U.W. Law School, Gramling launched a legal career that included six years at the Legal Aid Society in Kansas City, Mo., nine years at Legal Action of Wisconsin in Milwaukee, and 21 years as a Milwaukee Municipal Court judge. Gramling, who serves as president of the Wisconsin Access to Justice Commission, is now retired. But he still puts his legal skills to work as a volunteer at the Center for Driver’s License Recovery and Employability, a public-private partnership he helped launch while he was a municipal judge. Some years ago, Erica López was a Ph.D. student in human development and early childhood education and also a research assistant and fellow at the Yale Center for Social Policy and Child Development. She wanted to do something more hands on to help promote the health and education of children. Eventually she went to work as a paralegal at the National Center for Medical Legal Partnerships in Boston and then on to study law at U.W. Law School. “It took me seven years to get to law school,” López says. She puts all those years of experience to good use now that she’s a lawyer at Legal Action of Wisconsin in Madison. Her studies and research in child development and education come in handy in child disability cases. Another part of her job entails mentoring and advising lawyers who participate in Legal Action’s Volunteer Lawyers Project, for which she serves as director. Take a realistic look at what’s in store if you choose a career in public interest law, advises Beth Ann Richlen. “Go into it with your eyes wide open about the sacrifices it requires,” she says, “especially the financial ones” due to the lower salaries. Dianne Molvig is a frequent contributor to area and national publications. Richlen’s first job out of U.W. Law School in 2006 was at Legal Action of Wisconsin in Milwaukee. A couple of years later, she moved to Wausau to take a job at Wisconsin Judicare, where she’s now the civil unit manager and development director. Michael Rosenberg took a fairly unusual route to public interest law. He spent the first 21 years of his career in private practice, mostly in big firms in Milwaukee. Since 2011, he’s been an attorney with Community Justice Inc. (CJI) in Madison. CJI is a nonprofit law firm, in operation since 2004, that states as its mission “representing the legal needs of low-income and underrepresented people in the courtroom and the community.” CJI serves clients who earn up to 300 percent of the federal poverty guidelines, equal to, for example, an annual income of $72,900 for a family of four. Rosenberg says he didn’t consider public interest law when he was at Northwestern Pritzker School of Law in the late 1980s. Nor does he recall much attention having been focused on that field. Going to work for a big firm “was sort of the normal track” to pursue, he says. When he graduated in 1990, he took a job at Foley & Lardner LLP in Milwaukee. 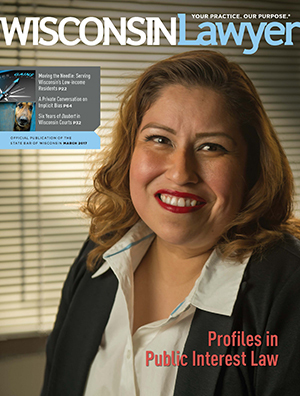 Diverse experiences steered Michelle Velasquez to where she is today. She’d been a social worker for six years before and while attending Marquette University Law School, where she earned her JD in 2010. Then she spent a year and a half at Centro Legal in Milwaukee, followed by four years in the appellate division of the State Public Defender. In 2016, she opened Civitas Law Group, a nonprofit law firm in Milwaukee, along with co-founder Anne Jasper. They have since added a third attorney, Jessica Marquez Murphy. Civitas takes clients who earn up to 400 percent of the federal poverty level. Because its funding comes from client fees, not grants and other outside sources, Civitas has flexibility in the clients it takes, whether that be in terms of income, citizenship, or other factors. It can serve people who often fall through the cracks between legal services agencies and traditional law firms. “There’s a market for legal agencies that are a little different,” Velasquez says. A first-generation college graduate and the first lawyer in her family, Bauer finished U.W. Law School in 2009 with $137,000 in debt for her undergraduate and law school education. She faced loan repayments of $1,400 per month – an impossible amount on a public interest lawyer’s salary. With loan forgiveness, she’ll pay about $300 per month for a total of 10 years. Bauer does her best to spread the word about loan forgiveness to others. “I’ve been teaching classes on this since I was a 2L,” she says. By then, she’d become a sort of self-made expert on the topic, out of necessity. She had to find a way to be able to pursue her dream career: public interest law. The program that’s been most useful to Bauer is funded by the College Cost Reduction and Access Act (HR 2669) of 2007. This assistance is available to anyone in public service, not only lawyers. Loans must be direct loans, not from private sources, Bauer explains. This type of aid does require ongoing paperwork and monitoring. Each year, the borrower must submit a certification form and make sure payments get credited properly, which can be a hassle, as Bauer has learned. Twenty-four states offer loan forgiveness programs. Some are funded through state legislative appropriations, while others rely on funding from the private sector or from interest on lawyers trust accounts (IOLTA) funding. Wisconsin is not one of those states. For complete information on the various programs available, Bauer recommends visiting the website of the National Consumer Law Center’s Student Loan Borrower Assistance Project.